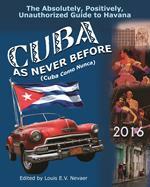 Cuba As Never Before/Cuba Como Nunca is the first guidebook compiled since Cuba and the U.S. renewed diplomatic relations. It is a singular collaboration with Cuban contributors. Your passport to Cuba, it has the most relevant and up-to-date advice on where to eat, where to stay, what to do, and what to make of Cuba as it changes. With an emphasis on culture, the guidebook offers an exhaustive listing of clubs, art spaces, cultural venues, and the ever-thrilling music scene. This will be a trusted companion, revealing the secrets of Cuba, the Cuban Revolution, and how to make lifelong friendships with the Cuban people. It's impossible to really know Cuba without the insights offered here, including: • AirBNB recommendations in Havana and principal cities-the first guide to list hundreds of AirBNB choices • Highlights show you the simplest way to tailor your trip to your own personal needs and interests • Insider tips on cigars, rum, contemporary art, galleries, cinema, music, dance, and shopping • Essential Information to Build your Trip, including airlines, hotels, restaurants, car rentals, and cultural events • Honest Reviews, including restaurants, hotels, sight-seeing, and the behind-the-Revolution back stories that make Cuba come alive as never before • Cultural insights into Cuban culture, from Santería to the ghosts of the Malecón, from where Che got his Rolex watch to why Fidel's mother slapped him across the face, from the Mexican diplomat who saved Cuban Jews by giving them fake Mexican passports to where to how Fidel celebrated the first anniversary of the Revolution • Art insights to help you understand why Cuban art is hot and who's who in Havana's explosive contemporary art scene-and which foreign dealers are at the forefront of bringing exciting works of art to collectors around the world • City Guides for Havana, Varadero, Matanzas, Cienfuegos, Villa Clara, Sancti Spiritus, Camaguey, Santiago de Cuba, and more • The Cuban Diaspora: why it is now at the forefront, and hot it is driving changes as investment and business opportunities present themselves Cuba As Never Before/Cuba Como Nunca offers an unprecedented look into the new Cuba as Havana and Washington move past more than half a century of conflict and recrimination. Tourism in Cuba has boomed with the resumption of diplomatic relations between Cuba and the U.S., and a just-published travel guide offers an up-to-date look at visiting the country. 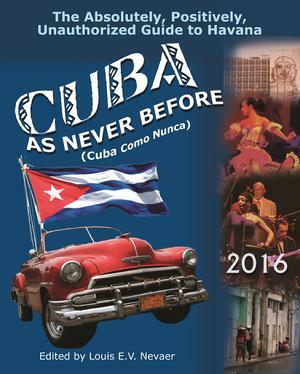 “Cuba As Never Before” or in Spanish, “Cuba Como Nunca,” by Louis E.V. Nevaer, looks at not just classic attractions like Havana’s rum museum and Ernest Hemingway sites, but also offers a guide to some of the newest places of interest to tourists, including the contemporary art scene, private restaurants known as paladares and even Airbnb listings. The book also offers advice on car rentals, tipping, cruises, flights, tour companies and private guides, and explains current regulations on travel by American citizens. Offbeat recommendations include La Marca tattoo parlor, Arte Corte Papito’s hair salon, and Promociones de ICAIC for original Cuban movie posters. The book also offers information on communities and subcultures ranging from Cuba’s gay and lesbian scene to surfers, Santeria and Cuban Jews. To order, click on image to the left.